As expected, the Yankees announced this afternoon that J.A. Happ will start Game One of the ALDS tomorrow night. It’ll be Happ vs. Chris Sale in a matchup of veteran lefties. Aaron Boone confirmed Masahiro Tanaka will start ALDS Game Two on Saturday night. Happ is one of the few starting pitchers who fared well against the Red Sox this season, holding them to five earned runs in four starts and 22.2 innings. Last week he shut them down through five innings before giving up a sixth inning grand slam to Steve Pearce with the Yankees leading 8-0. 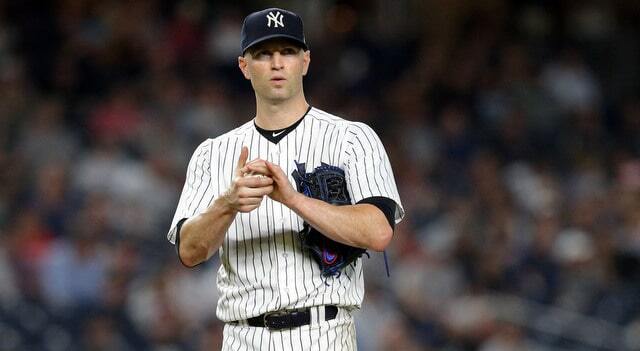 The Yankees deliberated for a while over the Wild Card Game starter. Happ in Game One and potentially Game Five of the ALDS was presumably an easy call. The Red Sox have announced their four-man ALDS rotation. It’ll be Sale, Price, Porcello, and Eovaldi in that order. The Yankees can bring Severino back for Game Three on normal rest and I imagine that’ll happen. There are three possible scenarios for Game Three: You’re up 2-0 and trying to put the series away, down 0-2 and trying to stay alive, or tied 1-1 and trying to take a 2-1 lead. I want Severino on the mound in all three situations. The 25-man ALDS rosters do not have to be submitted to MLB until tomorrow morning and that’s when they’ll be announced. Boone said today Sabathia and Stephen Tarpley will replace Kyle Higashioka and Tyler Wade. That means Brett Gardner becomes the designated pinch-runner, which makes sense. I’m not sure when you’d use Tarpley over one of the usual late-inning relievers, but I guess we’ll find out. Anyway, the Yankees and Red Sox will announce their ALDS rosters tomorrow and we’ll see how things shake out. The ALDS opens with Game One on Friday night (7pm ET) and Game Two on Saturday night (8pm). The series shifts to Yankee Stadium for Game Three on Monday (start time TBA).